What are the advantages of an air source/ground source geothermal heat pump system? Greater efficiency. Air source heat pumps are often more efficient in less extreme weather. The endless supply of free flowing outdoor air can provide a great source of convection for longer run times without the thermal depletion of the earth field that can occur with geothermal units. Ground source systems are often more efficient in extreme weather conditions. The constant and more stable ground temperatures can provide an efficient source of convection as long as the earth field is not over worked. The ability to utilize both sources gives the Groundhog a unique advantage to achieve comfort and efficiency. Lower installation cost = Lower geothermal heat pump cost. The Groundhog’s multisource technology requires less drilling to obtain the same BTUH as conventional geothermal systems. Faster installation time. Less drilling is less time consuming, and better still, the Groundhog can function without being attached to the earth field which is ideal when a nonfunctioning system needs to be replaced quickly. The earth field can be installed at a later date, and the homeowner can start enjoying the comfort as quickly as with a typical air source system installation. Less threat of a total system failure. In the rare event of a ground loop failure, the Groundhog can still produce adequate heating and cooling. More efficient dehumidification. 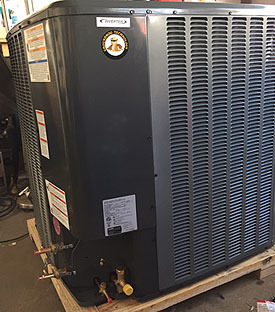 The Groundhog system uses a multi-speed compressor, as well as a variable speed fan motor to remove more unwanted humidity in the cooling mode. Better balanced heat control. The Groundhog air handler is equipped with MaximizerTM technology which measures the temperature rise at the indoor coil. This allows the system to determine the correct compressor and heat stage mode for the best balance of comfort and efficiency.